• As always PC Claire Murgatroyd has deployed to several locations with the speed gun. Enforcement has been carried out on West Road, Station Road & on the High Street. PCSO Devey is now also trained in the use of the speed gun and between them a total of approximately 40 drivers have been prosecuted since the turn of the year. • PCSO Devey has being paying visits to our primary schools and giving the children an input on internet safety. The digital world and use of the internet is an aspect of everyday life which starts at a very young age. Safeguarding those that are most vulnerable and at risk is essential and her visits have been greatly received. • The next ‘Police Surgery’ is going to be held at the Library in Cuddington on Saturday 31st March 2018 between 10:00 – 12:00 by PCSO Devey. It’s a ‘drop in’ session and a chance for you to meet your local PCSO who will be available for any concerns you wish to express, questions you’d like answering or just a general chat about policing in the area. Further surgeries will be held in different locations which will be announced nearer to the time. 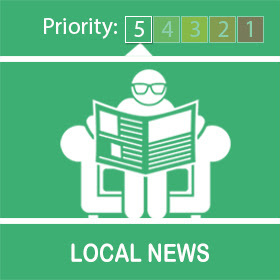 • In late January, an elderly couple living in the Cuddington area were visited by four males who took it upon themselves to carry out some roof repair work without consultation as to what they were doing and at what price. After a few minutes one male came back into the house stating that the work had been done and the cost would be £700! The elderly gentleman handed the male all the cash he had available which was £70, this was taken and the men stated that they would be back later for the rest. The group of men made use of a white van with a set of ladders on top. No further description is available of the van or the men. As mentioned before, please be vigilant in our community and look out for others in your street, especially if you know they are at risk of being targeted due to their age or any other vulnerability. • A small group of teenage youths have been causing anti-social behaviour in the library at Cuddington. They have taken advantage of the kind staff in there, who have allowed the youths to make use of the facilities. The youths however have gone onto to be verbally abusive to staff, cause minor damage and being a general nuisance to the public. This sort of behaviour will not be tolerated and the process of identifying the youths has begun. It has been a surprise to the parents of the youths when they have received a knock at the door from officers informing them of their teenagers antics. I thank you all for the continued support you show us on a daily basis. We are here to help, support and serve you as a community. It is vital in our day to day policing that intelligence is reported no matter how minor you think it may be and this can be done via calling Cheshire Police on 101, reporting it to Crime Stoppers on 0800 555 111 or email Cheshire Constabulary and in every case you can remain anonymous if you wish.